**Free mid-size car while cars are available. Not valid with any other special offers. The car can be upgraded for a minimal fee. Includes Lihue airport pick up and drop off unlimited mileage and taxes. Cars are on a 24-hour basis so if flight arrival and departure times exceed the number of days reserved, there will be an additional charge. Like right out of the scene of a magazine, the garden oasis around Waikomo Streams 202 welcomes you to immerse yourself in the beauty of Hawaii. Just off the private lanai of the ground-floor condo, walls of bamboo, towering coconut trees and a collection of tropical greenery create a serene setting for your stay. Your ohana – family – can spend quiet evenings in the living room with couch, two chairs, flat-screen TV and tropical décor. Have some quality family time gathered around the 4-person dining table, eating a good meal or just enjoying some great conversation. Before you sit down to dinner, put your favorite vintage in the wine fridge and mix your favorite drinks at the small bar cart. Pretty and practical, the fully-equipped kitchen has handsome cherry cabinets, granite counters, stainless steel appliances, and under-counter lighting. The open kitchen sits between the living room and dining room, so the cook can stay part of the action. You won’t have to count sheep thanks to the master bedroom’s comfortable king bed, outfitted with tasteful blue bedding. The master has a large dresser and closet for storage, flat-screen TV and patio doors out to the lanai. If you need additional sleeping space, the living room couch doubles as a sofa sleeper. No need to fight over space getting ready in the morning; the bathroom has a large vanity with a single sink and a tub and shower combination with glass door. Pamper yourself with complimentary Island Soap and CandleWorks toiletries. 1. On-Site Amenities: Welcome to your own secret garden! The community's lush greenery, bamboo walls and bubbling streams, and ponds set the tone for your tropical getaway. Spend the afternoons around the sparkling pool while the kids splash in the 3-foot kiddie pool. There’s also a grassy BBQ area for guests to use. 2. Convenient Location: Just a short walk away is the Kukui’ula Shopping Center, full of stores and restaurants. You’re also just a 10-minute walk from the gorgeous Sheraton Kauai beach and the RumFire restaurant. 3. Great Value: Don’t settle for a cramped hotel room when you can vacation in this roomy one-bedroom, ground floor villa. You get privacy and space, plus lots of great amenities like Wi-Fi, washer and dryer and complimentary Kauai Coffee Company coffee. Get your shopping on at the Kukui’ula Shopping Center, where you can find a variety of popular and local stores and restaurants. Don’t miss the Farmer’s Market every Wednesday for fresh produce and locally-made products. Hit the sand and the surf at one of the pretty beaches, all less than a 15-minute walk away. Baby Beach is great for families with younger kids, while the Sheraton Kauai and Lawai Beaches are great for all ages with snorkeling and water sports. If you’re looking for a resort-style stay, we have you covered. For an additional fee, you’ll have uninhibited access to the Poipu Beach Athletic Club, home to a fitness center, hot tub and sparkling pool with a waterslide and sand-bottomed kiddie section – everything you need to work out, cool off or wind down. If you’re looking for a resort-style stay, we have you covered. For an additional fee, you’ll have uninhibited access to the Poipu Beach Athletic Club, home to a fitness center, hot tub and sparkling pool with a waterslide and sand-bottomed kiddie section - everything you need to work out, cool off or wind down. MEMBERSHIPS ARE LIMITED, PLEASE LET US KNOW IF YOU WOULD LIKE TO SECURE A MEMBERSHIP PRIOR TO YOUR ARRIVAL. This was a great spot for our stay on the south shore of Kauai. Centrally located and within walking distance to anything we might need or want during our stay. The condo had everything we needed and more. Having no AC was not a problem. We kept the shades pulled during the day and opened the doors at night. The fans provided plenty of air. It was also nice to have a pool on site. All in all, a wonderful stay! We were pleasantly surprised to have nicely stocked kitchen and baths with pans, dishes, soaps, trash bags. The condo was clean. The community was quiet and very conveniently located. The room has no air conditioning but there are several room fans. We would highly recommend this company and condo. We loved staying here. The included car rental was a huge plus and was super easy to coordinate. The hosts were quick to respond to any questions. The condo was really clean and located in close proximity to shopping, restaurants, and Poipu Beach Park (2 minute drive). The only downside was no air conditioning but the hosts provided lots of fans to make up for it. Thanks for a great vacation in beautiful Kauai! Had an absolutely wonderful stay here. Loved the location and how easy it was to get to everything; beaches, towns, shopping, food. Enjoyed access to the pool on site and really, really appreciated the car rental included with the place. Being able to use the boogie board, chairs, and umbrella that where in the space was very nice. Had a great stay! Would stay again at this location! Review posted on Airbnb for Waikomo Streams 202 on 10/23/18: We loved staying here. The included car rental was a huge plus and was super easy to coordinate. The hosts were quick to respond to any questions. 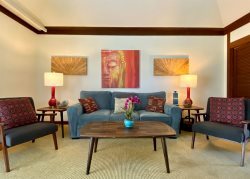 The condo was really clean and located in close proximity to shopping, restaurants, and Poipu Beach Park (2 minute drive). The only downside was no air conditioning but the hosts provided lots of fans to make up for it. Thanks for a great vacation in beautiful Kauai! It was a very nice place in a great location. A lot of great amenities and extras in the condo. The place did get very warm even with fans making it hard to sleep. We were surprised how much we had to pay for car hire insurance which would have been good to know beforehand because in Australia insurance is included in the car and this added significant extra expense. It was a great apartment in great location. Enjoyed staying here. Bottom floor property with very little air flow will be hot during summer. 2 of the 3 beds are sofa beds. There is a back gate exit to Poipu Road, which is a short walk to the ocean front and 1/4mile to the Sheraton where the beach starts. Property is older, but clean and has well stocked kitchen and a decent amount of beach gear. Pool is convenient, but fenced in with no view and a bit small. The grounds are nicely landscaped and well maintained. Trash dumpters are located on opposite end of parking lot, so a bit of a walk. I asked about a local luau and got some good info and we were glad about the luau at Gaylords that we ended up choosing. This property was like finding a hidden gem! The spacious interior was even better than the photos portrayed. The kitchen was stocked with all the items we would need along with spices etc. The front closet had beach chairs, mats, coolers, snorkel gear & an umbrella-which came in very handy! Having a small washer & dryer was a welcomed convenience as well. The pool was very close to the condo so we didnt have far to walk. The complementary car was icing on the cake! We look forward to a future visit. Mahalo! We never made contact with staff and all went well..
We enjoyed our week and even though it rained the first couple of days, the rest of the time was beautiful.. Thank you for the arrival gift. The pool was nice and the flowers were wonderful. Thank you. Great location near Poipu and the Kauai Coffee Plantation. There is a mall right next door with great food and driving proximity to grocery stores. The host is very responsive and bonus was that it included a rental car which saved us at least $100-120 dollars. Very personalized experience and recommendations (read their guidebook!!). Big, spacious, and clean. I also believe the weather in the southern part of Kauai is more sunny and less rainy. I would come back with my family again! Would definitely recommend Great Vacation Retreats and book with them again! We absolutely enjoyed our stay! The condo was very well cleaned and had everything that we needed! We felt very at home and safe. The car rental was a highlight for us! We definitely would not have been able to see half the amount without it! A/C would have been ideal but there were lots of fans, both ceiling and movable. The kitchen is well stocked for light cooking, which we used often. We really enjoyed being in the south as it made for short trips to various locations around the island. There are pristine beaches about 5 minutes away. Great place to stay. The condo was very comfortable, everything you could need, including all kitchen items and a washer/dryer in the apartment (beats having to pay $5 each time you want to do a load of laundry!). The clincher was the rental car, though. A great price and a car, too - so much so that I moved to another GVR place after my trip was extended, but Waikomo 202 wasn't available. Friendly, responsive and very helpful. Restful,roomy and well appointed condominium. Very peaceful pool area with BBQ facilities.